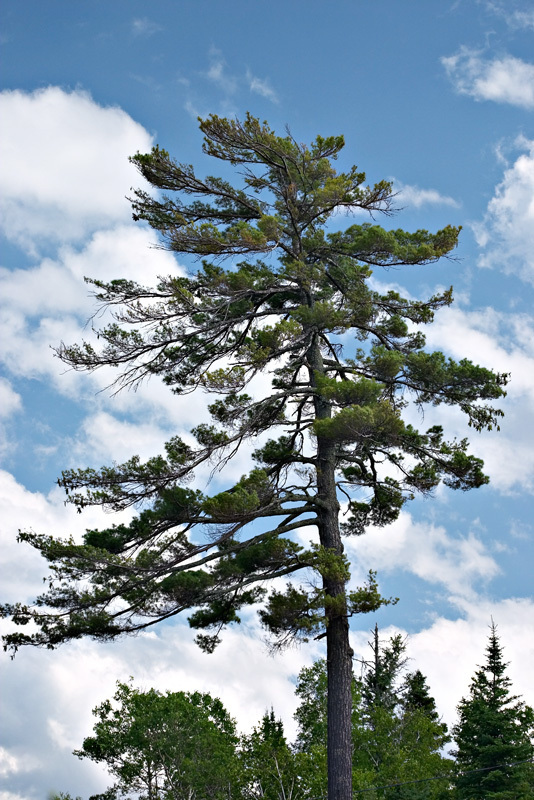 Scientific Name(s): Pinus strobus L.
This photo of an eastern white pine near Sioux Narrows, Ontario, was inspired in part by Arthur Lismer’s A September Gale. Pinus strobus has a long history of human use. Thank you for your wonderful presentations. It provides great relaxing pleasure EACH day in the course of hectic activities. It is a retreat to tune in each day to a new creation in the outside world away from business activities. They also allow me to provide a flower each day to my wife….. Very sincerely appreciated. Keep up the superlative effort. Hey Artifacts, we certainly do have a place for you to post pictures for plant ID. Take a look at our UBC Botanical Garden Forums and in particular the Plant Identification Forum. You can learn a lot of plants just by reading through the pages of that forum. It is also fun to go through the old posts that have been identified to see if you can ID the plant before you scroll down to the answer. You will not be able to post your own images unless you register for the Forums. It only takes a moment and you will get more out of the experience if registered.